Hunger is defined as "... the physical sensation of desiring food. When politicians, relief workers and social scientists talk about people suffering from hunger, they usually refer to those who are unable to eat sufficient food to meet their basic nutritional needs for sustained periods of time." on Wikipedia. "In 2010, Walmart and the Walmart Foundation made a historic $2 billion commitment to fight hunger in America through cash and in-kind donations. The Fighting Hunger Together leverages Walmart and the Walmart Foundation’s size and scale to provide nutritious food and funding to nonprofits that are committed to finding solutions for this important issue." This clever ad campaign leaves the clear impression that Walmart and its fake-food corporate suppliers are fighting hunger. Truth is that nowhere does Walmart state that it or its partners "are committed to finding solutions for this important issue." 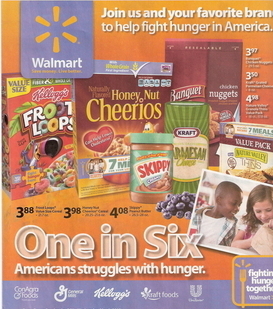 "In-kind donations" by Walmart and its mega-corporate food suppliers means that a majority of their joint "$2 Billion commitment" will be their own fake food products... Froot Loops, Skippy peanut butter, Banquet chicken nuggets, canned Kraft cheese, Nature Valley bars, Honey Nut Cheerios, and the like... to food banks, charities, and soup kitchens serving the hungry in their communities. Such processed fake foods are chock full of fat, salt, and sugar, as well as chemicals, additives, fillers, emulsifiers, artificial colors and flavors, and much more. . Indeed, a fine example of ethics-free capitalism. Problem is... the hungry are still hungry! Great post. Sadly, as long as our USDA/HHS Dietary Guidelines continue recommend that Americans avoid whole, nutritious foods like meat and eggs in favor of cereal and grain products (whole grain! fortified and enriched!) the hungry in America will continue to be given foods that leave them hungry. I appreciate your focus on problems in the food industry, but the USDA/HHS Dietary Guidelines are the ones who have given industry the permission to call those foods in the Wal-Mart ad "healthy," while eggs are still to be limited or avoided altogether.